A heart shaped winter bonnet for a toddler rests in Grandma’s Someday Box with a set of mittens and a pink-as-can-be cap with white hearts and a tassel. They are Grandma’s knitted tokens of love. May I share some thoughts with you, too? “I like the mother in this story,” a friend wrote inside her gift-card. 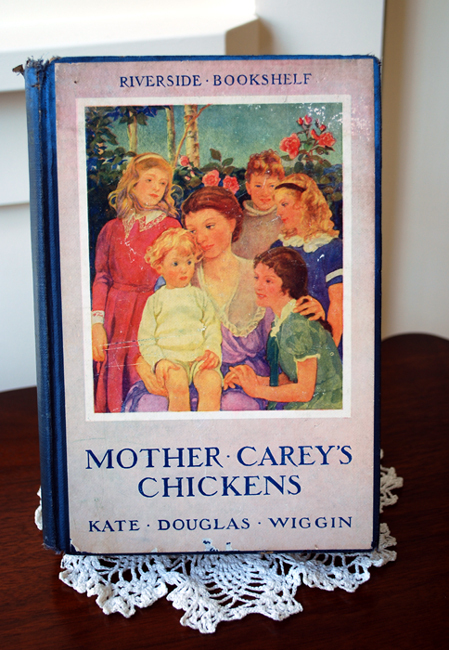 I unwrapped the parcel and beheld a copy of Mother Carey’s Chickens by Kate Douglas Wiggins. The book cover is as pretty as her card and the gesture of the gift so thoughtful, that I displayed the book in the parlor. When it needed to give place to Christmas greenery it joined the pile of books by my bedside. The winter months are dark months. Never mind. The pages of this children’s novel glow in the dark. They chase away the winter blues. And yes, my friend is right. I do like the mother. She exemplifies what Mark Twain said about his mother. At the end of a day all-a-whirl of activity light reading may be all a mother can digest. On such days a chapter of Mother Carey’s Chickens lends a friendly hand of calm. Fifteen minutes of silent reading bring a chapter to a close. And when the book and eyelids are closed, too, a peaceful repose will follow. This is surely a “feel-good” story. It demonstrates the love within a family circle – love that spills over to a widening circle of friends. The characters “consider one another.” It is something the young ones learn with just a touch of growing pains. 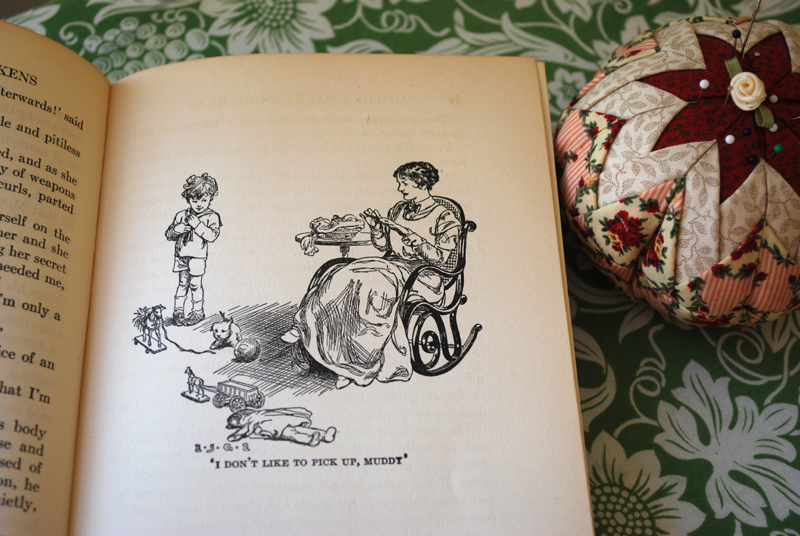 The story was published in 1911 with a setting that takes place at the turn of 20th century in New England. The Carey family is a happy one although Father Carey is in the navy and must be away much of the time. His salary provides his wife with a chambermaid-nanny and cook. Early in the story Father becomes seriously ill and dies. 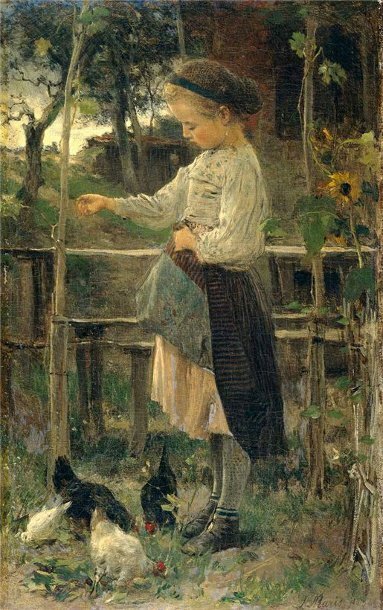 Mother Carey’s chickens (her children) are thoughtful and obliging most of the time while enduring this trial. The memory of their father along with their affection and esteem for their mother, helps them to be so. The story really is about the eldest daughter, Nancy who is coming-of-age. While Mother Carey quietly endures deep sorrow Nancy befriends her in practical and lighthearted ways. Reading a bio of author Kate Douglas Wiggins I quickly spotted a parallel of life circumstances in she and her characters. In the 19th century it wasn’t unusual to find the phrase “A Token of Love” stitched onto a sampler by girls enrolled in Quaker schools. During my reading I picked up a Quaker style sampler I had left untouched for many months. The perfect symmetry of the mysterious Quaker half-medallion motifs can be tricky. I remember how often I had to backtrack and pick out stitches gone astray. 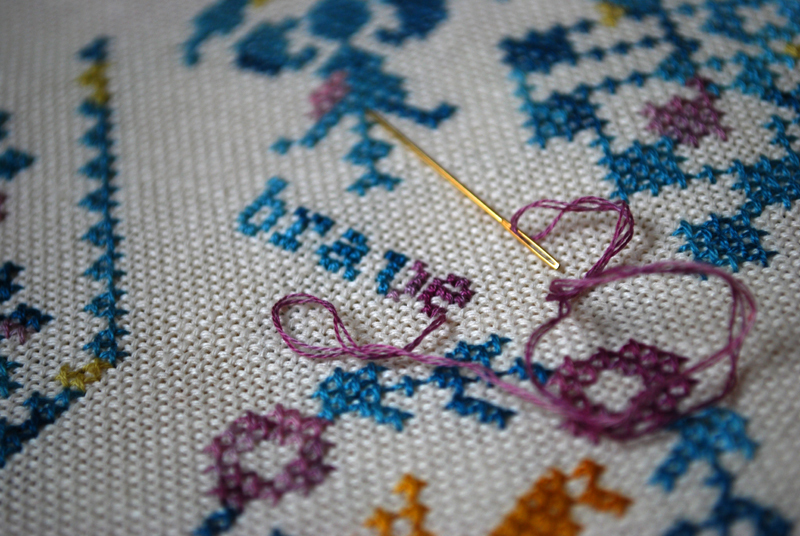 For this reason the sampler was left in a drawer – until I felt fit for it again. According to the chart, the last stitches are in the wreath, however I didn’t stop there. I sought to personalize it. I kept a lookout for some inspiring words. For days and days I waited until something pithy made its appeal. Then the following paragraph from chapter five of Mother Carey’s Chickens provided just that. The Careys must get used to the novelty of strict economizing. With their father gone the servants are dismissed. Chores are adopted as a way of life. But they rally. How? "The only thing to do was to remember father’s pride and justify it, to recall his care for mother and take his place so far as might be; the only thing for all, as the months went on, was to be what mother called the three b’s – brave, bright, and busy." Could you use a winter motto? The three b’s became a winter motto of mine. I can use the reminder. One by one the three b's were stitched in cloth. This Quaker sampler has random splashes of color. I carried the tiniest bit of splashing over to the lettering, too. The birds in their golden feathers are chickens, of course. I might applique the sampler onto a pajama bag of gold fabric with blue rose buds. I’ve been blessed to know women who rally during lean times. Out of love for God and family they are brave, bright, and busy. These women are an encouragement to me. The books and your lovely prose is always so welcomed. The Railway Children provided just such respites for me last winter. I've read Rebecca of Sunnybrook Farm by Kate Douglas Wiggin, but never any of her other work. It's interesting to read about being brave, bright,and busy today. My great-nieces were with me this afternoon. My own children are away at school, and I've become accustomed to the quiet ease of homemaking with just my husband and me! I can sympathize with Mother Carey who suddenly has to manage tasks that others have been responsible for. I told my mom that I understood better scenes from books of storms at sea when the pilot lashes himself to the wheel and lets the boat run. That's how I felt this afternoon! Now, I'm having a quiet cup of tea and visiting with you. Thank you for the encouragement and the visit. You do such beautiful handwork. Love those three theme words, "brave, bright, and busy." I've never heard of this book before...but it looks wonderful! I'll have to keep an eye out for it at some of our local thrift stores or used book stores. Have a blessed evening...I so enjoy your blog! I have never heard of this book. I think I will see if I can find it on Amazon. Are you up for tea someday soon? I was so excited to see the title of your post! You see, I just downloaded this book onto my Kindle a couple of days ago. I'm just finishing Pollyanna Grows Up (the sequel, of course, to Pollyanna), and then I will start Mother Carey's Chickens. 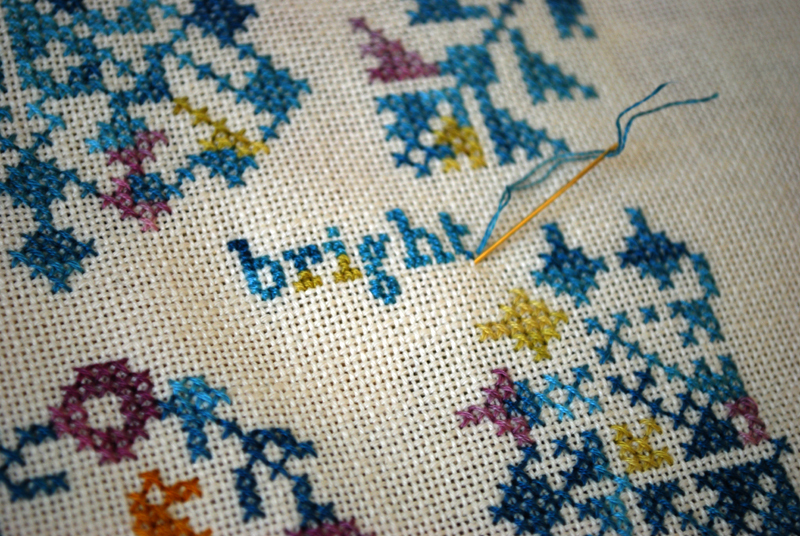 The splashes of color in your sampler are very pretty. Yours is one of several favorable reviews I've heard on Mother Carey's Chickens. I'll be adding it to my list. Your copy's cover is so pretty and I like the serenity in the family's faces. 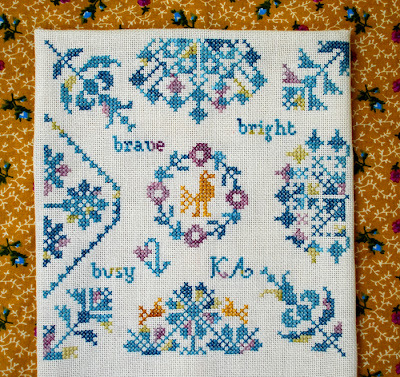 Brave, bright, and busy should be my winter motto also. Perhaps I'll write or paint it on something as a reminder as I have more stitching projects lined up than moments to work on them. I've just finished my first set of mittens and started another. Knitting is just the thing for those odd blocks of time or when listening to music (or piano practice!). 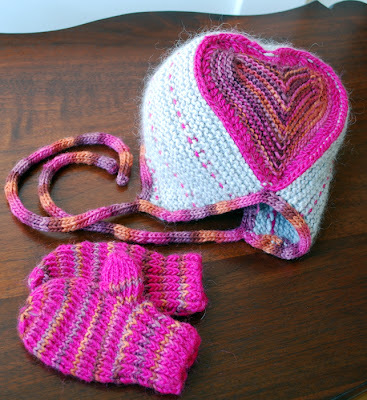 I love the bonnet, but the hat with hearts looks easier for the novice knitter? what a beautiful valentines set! 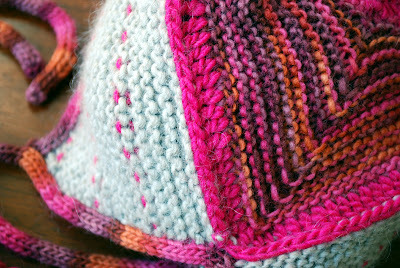 the more I knit, the more I crave and enjoy the quiet moments doing this at the end of the day. I'm finding in this season of life. of babies and up all night and little ones and messes that I don't have much time during the day to read or even think sometimes. So something simple as this sounds like it's just what I need. You always inspire me so!!! 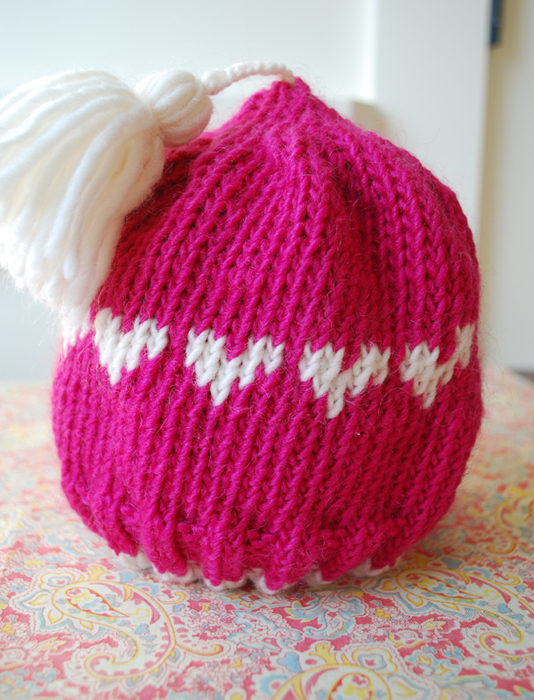 How lovely is your hat & mittens!!! The book is just darling and sounds like a keeper (I must stop adding all the books your recommend to my list...it's 2 miles long!). I smiled when I read the title of your post, as I have read that book myself! A dear friend let me borrow her copy. I adore your stitching...very pretty colors and it goes so well with the fabric. Your hand work is just beautiful. I hope to do more as my children get older. I love all your handwork projects! I've found myself reading and rereading more old books these past few years and realizing what a different world they paint from the one in which we live today. 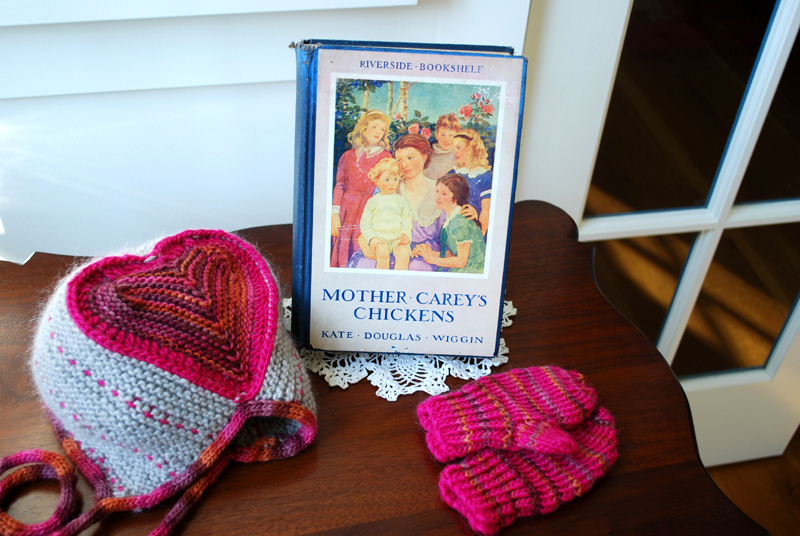 Lovely knitting and book. You always give bring us back to the simple, the calm, the truly important. Thank you for the reminders and inspiration. You could not have encouraged me more than you did today by your phrase..."I’ve been blessed to know women who rally during lean times. Out of love for God and family they are brave, bright, and busy. " This is going to be my motto this year, thank you so much. I really needed to hear this message today. And I absolutely love your needlework in this post! I have never seen a heart shaped bonnet, exquisite! And your cross-stitch I am sure you are VERY pleased how it turned out for I know I would be if I were you. Beautiful work indeed. This book sounds like just what I need. Though I'd prefer an antique copy, I shall settle for the free Kindle book and be thankful. Brave, bright, and busy. Excellent motto!